We have received 234 reviews of Letters from the Lighthouse . You can add a review or scroll down to read reviews. To send in your review of Letters from the Lighthouse , please fill in the info below and click the button labelled Send Review Now. Reviews will be checked by our team before they appear on the website. Your last name will not appear on the site, but we need to know who you are in case you win a prize! The Boy with One NameThe Dragon with a Chocolate HeartThe ExplorerJust Call Me Spaghetti-Hoop BoyWho Let the Gods Out? Emma was a secondary school English teacher in Devon. She has also worked as a news reporter on a local newspaper, an avocado picker and the person who punched holes into Filofax paper. When she isn’t writing books, she is reading them. Nowadays, she writes full time and it’s her absolute dream job. February, 1941. After months of bombing raids in London, 12 year old Olive Bradshaw and her little brother Cliff are evacuated to the Devon coast. The only person with two spare beds is Mr Ephraim, the local lighthouse keeper. But he's not used to company and he certainly doesn't want any evacuees. Desperate to be helpful, Olive becomes his post-girl, carrying secret messages (as she likes to think of the letters) to the villagers. But Olive has a secret of her own. Her older sister Sukie went missing in an air raid, and she's desperate to discover what happened to her. And then she finds a strange coded note which seems to link Sukie to Devon, and to something dark and impossibly dangerous. Emma lives in the Somerset hills with her husband where she writes and drinks tea under the watchful eyes of her two Jack Russell terriers. This includes links to her Facebook and Twitter pages. I can't tell you how much I love this book! Many mysteries occur and everybody wants to know the answer to them. And the need becomes greater once a code arrives. A code seeming impossible to crack. Three very important questions thrive in Olive's head: what does this mean? What is going on? Where is my sister? Matilda gave Letters from the Lighthouse 5 out of 5 and now plans to read Who Let the Gods Out? by Maz Evans. This book was great.this was a very exciting book that I couldn’t put down. Maizy gave Letters from the Lighthouse 4 out of 5 and now plans to read The Boy with One Name by J R Wallis. I'm giving this book a 4 because it was a very interesting book. I also like the fact that it is set in world war 2.I think that one thing the book could improve on is the ending but I would definitely recommend the author to carry on writing interesting books like this one. Jennifer gave Letters from the Lighthouse 4 out of 5 and now plans to read The Boy with One Name by J R Wallis. I give this book 4 stars because i think that it is a excellent book and I love the part when Olive gets hurt and then gets back on her feet.The thing that the book could improve on is the ending because olive doesn't find Sukie other then that the book it execllent. Summer gave Letters from the Lighthouse 4 out of 5 and now plans to read The Dragon with a Chocolate Heart by Stephanie Burgis. The good part in it was that it was very spooky and mysterious but it can be sometimes a bit boring, it might be better for a person that rather reads less adventure books. Pola gave Letters from the Lighthouse 3 out of 5 and now plans to read The Explorer by Katherine Rundell. This book didn't really catch my attention as I am not the type of person to enjoy this book. I wish the beginning could have been at bit more clear to what was going. Maisie gave Letters from the Lighthouse 4 out of 5 and now plans to read The Boy with One Name by J R Wallis. I really like that it was set in world war 2 and it was very mysterious! Nicole gave Letters from the Lighthouse 5 out of 5 and now plans to read The Dragon with a Chocolate Heart by Stephanie Burgis. Laibah gave Letters from the Lighthouse 4 out of 5 and now plans to read The Boy with One Name by J R Wallis. I really enjoyed this book as it has interesting chapters. This book reminds me of what it was like during WW2. I would recommend this book to people who enjoy realistic books with a touch of fantasy. Imaani gave Letters from the Lighthouse 5 out of 5 and now plans to read Who Let the Gods Out? by Maz Evans. This book was quite good, it had lots of detail and was interesting as well. The reason I rated it 3 stars is because I kind of got lost at the end . I love the fact its based on WW2 because we are currently learning about it in class! zainab gave Letters from the Lighthouse 3 out of 5 and now plans to read Who Let the Gods Out? by Maz Evans. I absolutely loved this book and i literally could not but it down it was fantastic! if there was a book two i would definitely read it. I recently found out about a book called walking on air and i am going to read that next. Ella gave Letters from the Lighthouse 5 out of 5 and now plans to read Who Let the Gods Out? by Maz Evans. Azira gave Letters from the Lighthouse 4 out of 5 and now plans to read The Boy with One Name by J R Wallis. I usually don't like ww2 set book boot this was thrilling and adventerous and overall it was excellent. Anand gave Letters from the Lighthouse 4 out of 5 and now plans to read The Boy with One Name by J R Wallis. Ravneet gave Letters from the Lighthouse 5 out of 5 and now plans to read Who Let the Gods Out? by Maz Evans. I found this book breathtaking! It gave me an insight how families were affected during the war. It was heart-rending yet amazing because it revealed tragic events and euphoric moments that Olive and many other people have to go through. Harmaan gave Letters from the Lighthouse 5 out of 5 and now plans to read The Explorer by Katherine Rundell. I loved this book because it was so mysterious and I never wanted to skip a sentence. It had such a moving story: it takes you on an incredible journey through the life of an evacuated child in WW1. Once you start reading this amazing book, you will never be able to put it down. Geethanjali gave Letters from the Lighthouse 5 out of 5 and now plans to read The Explorer by Katherine Rundell. This book was very good,once I got into it I could not stop!! !It was amazing you can really feel what it was like in world war 2.
lelannah gave Letters from the Lighthouse 5 out of 5 and now plans to read The Boy with One Name by J R Wallis. This book is amazing! I rated this book 5/5 because of the adventure,excitement and it helps you to understand WW2 and what it was like being an evacuee.I recommend this to 10 year olds and above. Emily gave Letters from the Lighthouse 5 out of 5 and now plans to read The Explorer by Katherine Rundell. This book is a wonderful adventure book filled with action, courage and mystery. When the protagonist Olive and her siblings (Cliff and Sukie) are caught in an air raid, their mother decides it is the right time for them to be evacuated. However, Sukie is missing, so Olive and Cliff travel alone to a small, coastal village in Devon.There, Olive solves many puzzels alongside her younger brother. This book helped me to understand what it was like in WWII from many perspectives. I really enjoyed solving all the puzzles as it gave my brain a real workout. Overall, I would DEFINITELY recommend this book to anyone who loves adventure and puzzles. Lucy gave Letters from the Lighthouse 5 out of 5 and now plans to read The Explorer by Katherine Rundell. I absolutely adored this book . I rated it a 5 out of 5 because of how amazing it was . I would recommend it to 10 years old and above because you need an understanding of what world war 2 was like . Isabelle gave Letters from the Lighthouse 5 out of 5 and now plans to read The Explorer by Katherine Rundell. I absolutely loved this book because it is about the world war 2.I recommend this book to people who like learning about history. I think this book is mainly for people aged 10 - 11 .This book made me understand about life in the world war 2. I liked this book because it is very interesting and makes me want to read on. Kelsey gave Letters from the Lighthouse 5 out of 5 and now plans to read The Explorer by Katherine Rundell. This book is a amazing! It is so heart warming and incredible.It's about a girl who has been evacuated with her brother and the town changes views on people so beautifully.This book also made me understand the life of a evacuee. I would recommend this book to any age group. Samantha gave Letters from the Lighthouse 5 out of 5 and now plans to read The Explorer by Katherine Rundell. This book was a page turner;I thought it was really interesting as it was set in 1941 when bombs were set off and war was effecting everyone.I would recommend this book for people of all ages,who like books that were set in the past. Harriet gave Letters from the Lighthouse 5 out of 5 and now plans to read The Explorer by Katherine Rundell. lAIBAH gave Letters from the Lighthouse 5 out of 5 and now plans to read The Boy with One Name by J R Wallis. I really liked this book because it is about World War 2. I like it when it is a happy ending. I would recommend this book for ages 10-11 because you need to understand all the vocabulary and bit o history about WW2. My favourite by far! Sky gave Letters from the Lighthouse 5 out of 5 and now plans to read The Dragon with a Chocolate Heart by Stephanie Burgis. I loved this book! I recommend this to people who like historical-fiction books. It's based in the WWII times and it contains some facts about how you would feel if you was evacuated. This is probably my favourite book so far and I have read Dragon With a Chocolate Heart,The Explorer and this book. I hope that others will enjoy this book and feel the emotions I felt through-out this story. Ellie gave Letters from the Lighthouse 5 out of 5 and now plans to read Who Let the Gods Out? by Maz Evans. At the start there was a brother and a sister and she is acting really wierd and it was because she sends letters to the light house and she is getting letters from the light house her self in then the brother finds out and he shocked. I liked how it is mysterious at the start and at the end. Beth gave Letters from the Lighthouse 4 out of 5 and now plans to read Just Call Me Spaghetti-Hoop Boy by Lara Williamson. I liked this book because it was very energetic and very happy. Whenever I went to bed I was feeling upset I read this book it made me very happy. Swaley gave Letters from the Lighthouse 3 out of 5 and now plans to read The Boy with One Name by J R Wallis. This book was amazing! The only reason I rated it 4/5 is because it made me cry too much! Cliff and Olive were the bravest kids I have ever seen! I couldn’t imagine leaving my home and leaving my family behind. I recommend this book to 10-12 year olds just because of the sophisticated phrases and description. Anyone who loves adventure and history should read this fantastic book now! Kaitlyn gave Letters from the Lighthouse 4 out of 5 and now plans to read Just Call Me Spaghetti-Hoop Boy by Lara Williamson. Letters from the lighthouse is a very heart warming book and once you get reading you cant stop!!! Milly gave Letters from the Lighthouse 5 out of 5 and now plans to read The Explorer by Katherine Rundell. Woah, this book was a-may-zing! I didn't think the front cover was that appealing at first but when I had read the first couple of pages I was absolutely hooked! I kept on thinking,'What happened to Suki?' It has a happy ending and I love it! Charlotte gave Letters from the Lighthouse 5 out of 5 and now plans to read The Explorer by Katherine Rundell. I liked this book because it was a book that i could not put down.The thing that i liked about it the most was when she reunites again with her sister Sukie because it is happy to see someone you have not seen for ages or that you have lost. Layla gave Letters from the Lighthouse 5 out of 5 and now plans to read The Boy with One Name by J R Wallis. I loved Letters From The Lighthouse because I enjoy history, especially World War Two, which this book was about. It describes the settings exceptionally well and really immerses you into a World War Two as a child evacuee. I would recommend this book to anyone, like me, who enjoys history. This story also teaches you to never give up no matter what; to always circle yourself with friends and look out for people you care about .I would give this book a full house. Mia gave Letters from the Lighthouse 5 out of 5 and now plans to read Who Let the Gods Out? by Maz Evans. Kayra gave Letters from the Lighthouse 5 out of 5 and now plans to read The Boy with One Name by J R Wallis. This is a good book because when I picked it up I couldn't put it down. It is so interesting and I love it because its about world war 2 ! Emily gave Letters from the Lighthouse 3 out of 5 and now plans to read The Boy with One Name by J R Wallis. i love history .this is my favourite book and i can't say it can't be because it is the last book i needed to read and i have read it. Scarlett gave Letters from the Lighthouse 5 out of 5 and now plans to read The Boy with One Name by J R Wallis. This was one of the best books I’ve read in my life. It’s packed with adventure and mysterious places and characters. At the end, it has a heartwarming moment when Mother, Cliff, Olive and Sukie reunited; and Sukie and Ephraim got to see each other again, as they are in love. This book deserves 5/5 if not a 10/5!!!!!!! Daisy gave Letters from the Lighthouse 5 out of 5 and now plans to read The Dragon with a Chocolate Heart by Stephanie Burgis. I loved it! We started reading a little bit in class and I had to wait for the Leeds Book Award books to arrive, and I knew that this book was the first book that I wanted to read. Plus, I love learning about World War 2 and this book sounded PERFECT! I loved this so much and I look forward to reading more of Emma's books! Chloe gave Letters from the Lighthouse 5 out of 5 and now plans to read The Boy with One Name by J R Wallis. Rhianne gave Letters from the Lighthouse 5 out of 5 and now plans to read The Boy with One Name by J R Wallis. 'Letters from the Lighthouse' is an incredible book with great description. Hollie gave Letters from the Lighthouse 4 out of 5 and now plans to read The Boy with One Name by J R Wallis. I wasn't that keen on this book but it was ok. The only thing i didn't like about it was the story line because it wasn't to my liking. Some of it was kind of sad which I didn't enjoy.My favorite part was probably the mystery aspect of it. EVIE gave Letters from the Lighthouse 2 out of 5 and now plans to read Who Let the Gods Out? by Maz Evans. Letters from the lighthouse was good but it wasn't really the best book so I gave it a 4. Thomas gave Letters from the Lighthouse 4 out of 5 and now plans to read The Dragon with a Chocolate Heart by Stephanie Burgis. This book was amazing and emotional but I feel there was a little bit of the story that was missing which is why I rated four instead of five. Daisy gave Letters from the Lighthouse 4 out of 5 and now plans to read The Boy with One Name by J R Wallis. I really enjoyed this book,it was definitely best so far. It was so great that it made not just a picture in my head of what was going on but I felt like I was there Wow!!! Lara gave Letters from the Lighthouse 5 out of 5 and now plans to read The Dragon with a Chocolate Heart by Stephanie Burgis. I loved this book because it contained facts about what life was like in WW2 whilst still being a piece of fiction. Hannah gave Letters from the Lighthouse 5 out of 5 and now plans to read Who Let the Gods Out? by Maz Evans. I enjoyed this book however near the beginning I was sometimes confused, and little bits of the book was a bit boring but I enjoyed most of it. I recommend for those who love a classic, heart-warming book. Victoria gave Letters from the Lighthouse 4 out of 5 and now plans to read Who Let the Gods Out? by Maz Evans. I thought this book was very good because I really like books like this because I like books what are quite old and when they get evacuated so I would definitely recommend this book to people aged 8-11.
rhys gave Letters from the Lighthouse 4 out of 5 and now plans to read The Boy with One Name by J R Wallis. I like it but it dosent explain what happens with Sukie and Ebram. Gus gave Letters from the Lighthouse 4 out of 5 and now plans to read The Boy with One Name by J R Wallis. This book taught me a lot of things.Firstly loads of things about the war. Secondly the dangers and hardship everyone had to face. My grandma was alive in the war and now this really gav me an insight to how lucky I am to live without war. I enjoyed reading this and really liked the mystery involved in it. Overall this book is made the decision even harder as I enjoyed so many of the books. So I am rating it 5/5 for its history and just general grabbing atmosphere!!??? Isabelle gave Letters from the Lighthouse 5 out of 5 and now plans to read The Boy with One Name by J R Wallis. This book is brilliant because it shows what life would be like in world war 2.I rated this book a 4 because it had a very slow start. RORY gave Letters from the Lighthouse 4 out of 5 and now plans to read The Boy with One Name by J R Wallis. I really liked this book and think that this is one of my favourite books. I would recommend this book to people who like adventurous books which have twists and turns in. Anjali gave Letters from the Lighthouse 4 out of 5 and now plans to read The Boy with One Name by J R Wallis. I didn't really enjoy this book because some of it was quite sad.When I started reading this book I sort of enjoyed it but when I got further into the book I found it quite sad and scary and didn't want to read on. Grace gave Letters from the Lighthouse 3 out of 5 and now plans to read The Boy with One Name by J R Wallis. Letters from the Lighthouse! February 1941, Olive and her brother, Cliff are evacuated to the coast of Devon. The only person with a bed spare is Mr Ephraim the local lighthouse keeper. There they solve a mystery that some how links their sister to Devon!! I really enjoyed the characters in the book and how you could picture them in your mind. This book would suit anyone who enjoys reading about history and WW2 time. There are lots of Surprises in the book and twists though the book but I really enjoyed it !! Hannah gave Letters from the Lighthouse 5 out of 5 and now plans to read The Dragon with a Chocolate Heart by Stephanie Burgis. Letters from the Lighthouse was one of the best books I have ever read!I enjoy reading books that are about Victorian and world war 2 books so this book is definitely my favorite (I even took it to the hospital to read while I was having my broken foot checked over). It was so good that when my mum shouted up for me to turn my light off I read it underneath my bed sheet! Thanks Emma Carroll a real page turner! Elizabeth gave Letters from the Lighthouse 5 out of 5 and now plans to read The Boy with One Name by J R Wallis. Isabella gave Letters from the Lighthouse 5 out of 5 and now plans to read Just Call Me Spaghetti-Hoop Boy by Lara Williamson. Jake gave Letters from the Lighthouse 4 out of 5 and now plans to read The Boy with One Name by J R Wallis. This book was the best book I have read and I rate it 5/5 because it kept me wanting to read on throughout the whole story. Olive goes to the cinemas and when sukie goes missing and sees her talking to a boy she wonders will she ever find her sister? Isabel gave Letters from the Lighthouse 5 out of 5 and now plans to read The Explorer by Katherine Rundell. Harry gave Letters from the Lighthouse 5 out of 5 and now plans to read The Dragon with a Chocolate Heart by Stephanie Burgis. I love this book. I think you should read this if you are feeling down because it shows that even if all hope is lost things can still go right. Jessica gave Letters from the Lighthouse 5 out of 5 and now plans to read Just Call Me Spaghetti-Hoop Boy by Lara Williamson. I loved this book it was really exciting and I was in a thrall every moment of the book. My favourite character was Cliff and Pixie. My favourite part was when someone got angry because there were no biscuits. Oscar gave Letters from the Lighthouse 5 out of 5 and now plans to read The Boy with One Name by J R Wallis. My thought's on Letters from the lighthouse, are that it is very well thought through and it also helps everyone learn a valuable lesson. It was very emotional with family relationships and reunions. I love all of the tension and drama and stepping back in time. Adding onto that, Emma Caroll is also great at leaving a cliffhanger at every page you read. Eva gave Letters from the Lighthouse 5 out of 5 and now plans to read The Boy with One Name by J R Wallis. I very much enjoyed this book because it is sad,funny and mysterious. I would recommend this book for anyone. Josefine gave Letters from the Lighthouse 5 out of 5 and now plans to read The Boy with One Name by J R Wallis. This book is probably one of my favorites. its a book about a girl (called olive)who is stuck in the middle of a war with her younger brother. This book is amazing but is also really sad. I would recommend this book to history lovers. Juliette gave Letters from the Lighthouse 5 out of 5 and now plans to read Just Call Me Spaghetti-Hoop Boy by Lara Williamson. This book must have been one of the best books I've ever read!I love WW2. I find this book interesting and sad.Even though it was sad, I loved the story behind it. Abigail gave Letters from the Lighthouse 5 out of 5 and now plans to read Just Call Me Spaghetti-Hoop Boy by Lara Williamson. I love this book its the best book ever ? Its a really good book you should read it if you haven't already. Jessica gave Letters from the Lighthouse 5 out of 5 and now plans to read The Boy with One Name by J R Wallis. This is my favorite book so far and it is probably going to stay like that because i love war things and the start is my favorite bit. alfie gave Letters from the Lighthouse 5 out of 5 and now plans to read The Dragon with a Chocolate Heart by Stephanie Burgis. I thought this book was heart-warming but also heart-braking at the same time. I also loved the mystery aspect of the book. I also enjoyed it because it was set in WWII. Overall I enjoyed this book. Hamna gave Letters from the Lighthouse 3 out of 5 and now plans to read Just Call Me Spaghetti-Hoop Boy by Lara Williamson. I really liked this book because it is about WWII and i really like books that are about the war they are very interesting and I also like it because while the war was going on her sister disappears and it makes the story more interesting. Elisabeth gave Letters from the Lighthouse 5 out of 5 and now plans to read The Boy with One Name by J R Wallis. Mae gave Letters from the Lighthouse 5 out of 5 and now plans to read Just Call Me Spaghetti-Hoop Boy by Lara Williamson. WOW this book is amazing! I loved it because it took me into a world about the 2nd world war that I didn’t know anything about. I felt sorry for Olive and cliff being sent away, but thought olive was kind and very brave. It did give me nightmares though, of bombs dropping on my house! Jasmine gave Letters from the Lighthouse 5 out of 5 and now plans to read The Boy with One Name by J R Wallis. Lily gave Letters from the Lighthouse 3 out of 5 and now plans to read The Boy with One Name by J R Wallis. I rated this book 4 out of 5 because although I loved the mystery aspect of it, I felt it went on for a bit too long. My favourite part was where the Jewish refugees stood up to Mr. Spratt and insisted they should be arrested too. Alistair gave Letters from the Lighthouse 4 out of 5 and now plans to read The Explorer by Katherine Rundell. Olive is a girl who is stuck in the middle of a war [with her younger brother Cliff].When their older sister mysteriously goes missing after a bomb explosion it is up to Olive and her brother to uncover the truth about what REALLY happened that night.Will she ever discover the truth? I rate this book five because i loved it from start to finish;i think it could be read by many people including some adults.This book is to do with history because of the war but in a more exciting way.That is why i want to read more of Emma Carroll's books and i am really looking forward to reading Who let the gods out? by Maz Evans. Freya gave Letters from the Lighthouse 5 out of 5 and now plans to read Who Let the Gods Out? by Maz Evans. Olive is a girl who is stuck in the middle of a war with Cliffe [her younger brother). I really liked this book because I'm really in to WWII.I love the words she used in the book.I would love to be an author when I'm older or a teacher. At first it was so exciting but as it got to the end of the book it got a bit boring to the end.This is why I gave 4 out of 5.This is why I recommend you read it now!!!!!!!. Chloe gave Letters from the Lighthouse 4 out of 5 and now plans to read The Boy with One Name by J R Wallis. This was the best book ever! I would recommend it for anybody who's in this age group.Its about WWII! and I love learning about WWII! Its interesting and intense with all that's going on in the book! India-Rose gave Letters from the Lighthouse 5 out of 5 and now plans to read Who Let the Gods Out? by Maz Evans. I really love letters from the light house, its so mysterious and very interesting. I would like to say a very big thank you because this book is awesome, that is why I gave it a book rating of 5 out of 5. When I am older I want to be an author and write books like this very special one, Letters From The Lighthouse. I am very happy I took part in the Leeds book Awards. Shannen gave Letters from the Lighthouse 5 out of 5 and now plans to read Who Let the Gods Out? by Maz Evans. I like the book because it was so adventurous and fun to read. Some people might have thought that this book is really bad but actually it's good. I haven't read this kind of book before. Alveena gave Letters from the Lighthouse 5 out of 5 and now plans to read Just Call Me Spaghetti-Hoop Boy by Lara Williamson. This book is incredible I LOVED READING IT and at some bits I wanted to go into the book and help. leo gave Letters from the Lighthouse 5 out of 5 and now plans to read The Dragon with a Chocolate Heart by Stephanie Burgis. I really enjoyed reading this book. This book was my first book and I think this is one of the best book here because it has loads of description and it tells you what it is about. My favourite character has to be Cliff because he is very adventurous and he is very cheeky to Olive and Queenie. I would recommend this book to people who love Emily Carroll and who likes World War Two. Ephraim gave Letters from the Lighthouse 4 out of 5 and now plans to read Just Call Me Spaghetti-Hoop Boy by Lara Williamson. Riya gave Letters from the Lighthouse 5 out of 5 and now plans to read Who Let the Gods Out? by Maz Evans. Amazing! This is one of the best books I have read in my entire life. I rated this book a 5 because it is set in the world war and I really love the characters. My favourite character is sukie. I would really like a second book and would love to see what could happen next! Georgia gave Letters from the Lighthouse 5 out of 5 and now plans to read The Boy with One Name by J R Wallis. I really love this book and I would recommend this book to 7-11 year olds; it dragged me through a rollercoaster of a few emotions. My favourite character is probably, no definitely, Olive because she just has a lot of humour and enthusiastic. Maisie gave Letters from the Lighthouse 5 out of 5 and now plans to read Just Call Me Spaghetti-Hoop Boy by Lara Williamson. This book is my favourite book so far since it was full of drama and comedy but at the the same time it was really sad... My favourite character was called Sukie because she was a secret spy and she was very mysterious.The setting was in World War two and it was about the evacuee children. Sukie was spying for the German Air force and it cost lives because of it, EVEN part of her family were killed in the process so what will happen next? Freya gave Letters from the Lighthouse 5 out of 5 and now plans to read The Explorer by Katherine Rundell. Following a bombing in London some children were evacuated to live with a strange lighthouse keeper whilst they were there, there was a strange mystery to solve about their sister Sukie and who was the man she met up with in the time of the bombing? In Devon Olive had a mystery to solve, a strange coded note that links Sukie to Devon and to something so dangerous it's almost impossible. Sam gave Letters from the Lighthouse 2 out of 5 and now plans to read The Boy with One Name by J R Wallis. THIS BOOK IS THE MOST LOVELIEST BOOK I HAVE EVER READ. If I could rate this a 6 i totally would! The book had me enthralled from the very beginning;I was fascinated by the confusing codes and mind-baffling mystery.The WW2 theme had me highly interested...Not only does it teach you about the Wars,it leaves you wanting to read MORE. It was like a war trying to put the book down it was so entertaining. LETTERS FROM THE LIGHTHOUSE is a heart-warming book full of mystery and suspense.It helps you imagine what it would be like to be a Jew,a refugee AND be an Evacuee! Emma Carroll is a wonderful author...Hopefully she will write more stories like this! Molly gave Letters from the Lighthouse 5 out of 5 and now plans to read Just Call Me Spaghetti-Hoop Boy by Lara Williamson. This is an amazing book, there was always a hint of mystery all the way through,that kept my hooked till the very end! I hope everyone has the chance to read this book because it is amazing. I would recommend this book from anyone in the ages of 10 to 13. Not only is it interesting it helps you learn about WW2 and what it was like back then it helps you understand how evacuees would of felt. I LOVE THIS BOOK!!! Jasmine gave Letters from the Lighthouse 5 out of 5 and now plans to read Just Call Me Spaghetti-Hoop Boy by Lara Williamson. If i could rate it a 6 i would!! !IT WAS ENTERTAINING! Ruby gave Letters from the Lighthouse 5 out of 5 and now plans to read Just Call Me Spaghetti-Hoop Boy by Lara Williamson. I really enjoyed the book because of the mystery and action and I really like how they put a book into world war 2 theme. Also I really like how characters at the start that wasn't the best turned out to be some of the best and most helpful characters in the book. This book is absolutely amazing and world war's is always an exciting theme. Ethan gave Letters from the Lighthouse 5 out of 5 and now plans to read Just Call Me Spaghetti-Hoop Boy by Lara Williamson. I think this book was great it kept me on edge the whole time from one thing to the next what makes me laugh is were learning about wartime in school and to read about it in a book is just fantastic. Wartime has always been a fun theme but you never think about being an evacuee just soldiers. David gave Letters from the Lighthouse 5 out of 5 and now plans to read Just Call Me Spaghetti-Hoop Boy by Lara Williamson. Idalia gave Letters from the Lighthouse 5 out of 5 and now plans to read Just Call Me Spaghetti-Hoop Boy by Lara Williamson. i loved this book: i loved the war theme's tension and the way the story came together at the end. it was also a surprise to find out that esther was jewish, and that olive's mum was mrs. 'arby' and was involved in getting the 32 refugees from france to budmouth point. Izzy gave Letters from the Lighthouse 5 out of 5 and now plans to read The Explorer by Katherine Rundell. This book is very absorbing, sensitive and genuinely magical. It is rich in thrilling details, adventurous, engaging and perfect for captivating imaginations. If you haven't discovered this book, you are really missing out! I'd say this book is suitable for children aged from 9-12. Katie gave Letters from the Lighthouse 5 out of 5 and now plans to read The Explorer by Katherine Rundell. This was the best book I have read so far. I really liked it because it was mysterious and there were lots of clues along the way. I would recommend this book for the 9-11 category therefore this is a good book to be on this age shortlist. This book has made me want to buy more of Emma Carroll's books. lexi gave Letters from the Lighthouse 5 out of 5 and now plans to read The Explorer by Katherine Rundell. This book is very good and funny i like the setting and the time. Elijah gave Letters from the Lighthouse 4 out of 5 and now plans to read The Boy with One Name by J R Wallis. I think this book was awesome because it brought tears to my eyes.My favourite part was when Sukie came to Devon.There was lots of sad parts in this story.So that's why I give it 5 stars. Sienna gave Letters from the Lighthouse 5 out of 5 and now plans to read The Boy with One Name by J R Wallis. I would not rally recommend this book and I would not say it is my favourite book.Although it is amazing it is not the book for me.And this book is for people who want to find out what happend in the war. Niamh gave Letters from the Lighthouse 3 out of 5 and now plans to read The Boy with One Name by J R Wallis. I rated this a 3 because I thought the start was a bit slow and boring but when I got into it the story line was fun and thrilling. Anand gave Letters from the Lighthouse 3 out of 5 and now plans to read The Boy with One Name by J R Wallis. I liked the book because of the world war theme and there was always something going on. I like it how it gives you a feeling of what it was like in WWII. I would recommend this to any history lovers. Brooke gave Letters from the Lighthouse 5 out of 5 and now plans to read The Dragon with a Chocolate Heart by Stephanie Burgis. chloe gave Letters from the Lighthouse 5 out of 5 and now plans to read The Explorer by Katherine Rundell. I really enjoyed reading and would really recommend it to quite a lot of peoplebecause how it explains the feeling in words. It was heart-touching. Kashmithra gave Letters from the Lighthouse 5 out of 5 and now plans to read The Boy with One Name by J R Wallis. This book is amazing!Its a very emotional story and it teaches you about ww1.My favourite character is all of them because they are all great!This is one of my favourites. Ava gave Letters from the Lighthouse 4 out of 5 and now plans to read The Explorer by Katherine Rundell. I LOVE THAT THIS BOOK IS SET IN WAR TIMES. its a lovely story with mystery's. It has a lot of wonderful adjectives and noun phrase. Plain wonderful. Aleesha gave Letters from the Lighthouse 4 out of 5 and now plans to read The Explorer by Katherine Rundell. This book is amazing! It is very emotional and it teaches you about WWII. I loved this book because it describes the characters really well. My favourite character has to be Olive because she is very brave. I wish this book never ended; its amazing! This is my favourite book so far. Rhianna gave Letters from the Lighthouse 5 out of 5 and now plans to read Just Call Me Spaghetti-Hoop Boy by Lara Williamson. Oliver gave Letters from the Lighthouse 5 out of 5 and now plans to read The Dragon with a Chocolate Heart by Stephanie Burgis. Alex gave Letters from the Lighthouse 5 out of 5 and now plans to read The Dragon with a Chocolate Heart by Stephanie Burgis. Joe gave Letters from the Lighthouse 5 out of 5 and now plans to read The Dragon with a Chocolate Heart by Stephanie Burgis. I think this book has lots of excitement and pauses in it that's why I would give it 5 out of 5.But I didn't because it also has lots of sadness in it, so I gave the book 4 out of 5.I would recommend this book to children aged 7 or over. I really enjoyed this book and I think you will too, so why not give it a go. Millie gave Letters from the Lighthouse 4 out of 5 and now plans to read Who Let the Gods Out? by Maz Evans. I have loved Letters from the Lighthouse!It is so mysterious and adventure-like!I have not read many mystery books but now I have I definitely like them especially this one! Layla gave Letters from the Lighthouse 5 out of 5 and now plans to read Who Let the Gods Out? by Maz Evans. This book is very exciting : being fast paced and slow at times. The characters are really relatable ; I didn't want to put it down! This was a book based about war and her sister was a very shady interesting character. Altogether this is a boook that I would highly recommend and suggest children 10-12 years old. Diya gave Letters from the Lighthouse 5 out of 5 and now plans to read Just Call Me Spaghetti-Hoop Boy by Lara Williamson. I thought this book was amazing. As this book is about WW2 and we our doing that topic in school. It is about a child who goes missing and these two children have to solve this mystery whilst a war is happening.This book made me keep turning the pages and not wanting to put it down. Jaskiran gave Letters from the Lighthouse 5 out of 5 and now plans to read Who Let the Gods Out? by Maz Evans. This book is about a girl and and her brother Cliff get evacuated to Devonshire coast.Her sister Sukie went missing and and they think the Lighthouse has something to do with it. Aadam gave Letters from the Lighthouse 5 out of 5 and now plans to read The Explorer by Katherine Rundell. this book is really entertaining book.i would reccomend to people who are really intrested in the world war.this such a reallllllllllllly good booook. the first was quite a shock.so just read this book. Amina gave Letters from the Lighthouse 2 out of 5 and now plans to read Just Call Me Spaghetti-Hoop Boy by Lara Williamson. I really enjoyed this book. At the start when there is a disaster the words make you feel rather touched. Emma Carroll used great emotional language to make you feel how the characters feel. Over all this was a great book. lanney gave Letters from the Lighthouse 5 out of 5 and now plans to read Who Let the Gods Out? by Maz Evans. Letters from the Lighthouse is an amazing book. It was very emotional and full of deep feelings. I absolutely loved the war theme, and how everything came together at the end of the book. I would definitely recommend this book to anybody who loves reading because it is amazing. Anshika gave Letters from the Lighthouse 5 out of 5 and now plans to read The Dragon with a Chocolate Heart by Stephanie Burgis. This book is just amazing. I have never read a book like this it is just amazing. I love WW2 and this book just everything I love inside it. This book is also very surprising when I found out that one sukie went missing two when they were evacued three when they found out Esther was Jueish. This book was very emotional and very deep. Everything about this book is amazing and I cant think of anyone who has written a book just like this one. WOW Emma Carroll you made a book that I love. Dania gave Letters from the Lighthouse 5 out of 5 and now plans to read Who Let the Gods Out? by Maz Evans. I really enjoyed this book- it is a very heart warming story and is well written with lots of WW2 vocabulary and facts. It is very realistic and I would recommend it to ages 9+ because it can be quite challenging to read. Isobel gave Letters from the Lighthouse 4 out of 5 and now plans to read Just Call Me Spaghetti-Hoop Boy by Lara Williamson. Ruby gave Letters from the Lighthouse 5 out of 5 and now plans to read Who Let the Gods Out? by Maz Evans. I enjoyed this book. I really liked the World War theme and how it gives you a feeling of what it would be like if you were in that situation. It was very interesting and a quite likeable book. I would recommend Letters From The Lighthouse for people who like the World War/historic subject. Kristel gave Letters from the Lighthouse 4 out of 5 and now plans to read The Dragon with a Chocolate Heart by Stephanie Burgis. I thought it was a wonderful read. The build up was gripping. I never got tired of the book. I recommend this to anyone who likes mystery, codes and surprises. I rating it 5/5 as it had everything you would want from a book. Sofia gave Letters from the Lighthouse 5 out of 5 and now plans to read The Boy with One Name by J R Wallis. I like this book because it made me feel like I was in the book. I would recommend this book for any age over 7 as it is about the war. Paige gave Letters from the Lighthouse 4 out of 5 and now plans to read The Dragon with a Chocolate Heart by Stephanie Burgis. I really liked this book because it wasn't just the text inside the book. But also it was the front cover that made me want to read it.If i am honest it is properly my favourite book i have read so far! Beau gave Letters from the Lighthouse 5 out of 5 and now plans to read Just Call Me Spaghetti-Hoop Boy by Lara Williamson. A very welcoming and heart-warming book. A very interesting start and then it went off track as started talking about totally different topics. In my opinion, I didn't really like it as I don't like this style of book all about war. I would recommend this book to someone who likes a War story line. My favourite part was when they went to the cinema at the beginning as it is a gripping start to the story. I would reccomend this book to people seven years and over. Lilly-Mae gave Letters from the Lighthouse 2 out of 5 and now plans to read The Explorer by Katherine Rundell. An exciting mystery filled with wonder;it's a book I'd read again. Jaiya gave Letters from the Lighthouse 5 out of 5 and now plans to read The Dragon with a Chocolate Heart by Stephanie Burgis. DEFINITELY 5 STARS it's soooo good definitely read it. Anya gave Letters from the Lighthouse 5 out of 5 and now plans to read The Boy with One Name by J R Wallis. I found the start very exiting. It is very sad in the middle. But all is good at the end. alice gave Letters from the Lighthouse 5 out of 5 and now plans to read Who Let the Gods Out? by Maz Evans. ethan gave Letters from the Lighthouse 3 out of 5 and now plans to read Just Call Me Spaghetti-Hoop Boy by Lara Williamson. This book is good but space to improve. I like the characters but not the theme I just do not really like WWII and all that. Over all this book very well written! arthur gave Letters from the Lighthouse 3 out of 5 and now plans to read The Boy with One Name by J R Wallis. I loved how it was set when war broke out because it add a lot of drama. It was pretty boring in the middle but then it gets amazing again. Gabriel gave Letters from the Lighthouse 1 out of 5 and now plans to read The Explorer by Katherine Rundell. Now it was a good book. I found it hard to connect with the characters the main moral I found a bit weird. But the upsides are it is a well thought out story I can tell and it is a good classic because the war idea is quite a common use in books I think she's done well to make it different war story. Freddie gave Letters from the Lighthouse 3 out of 5 and now plans to read The Explorer by Katherine Rundell. This book was good but it didn't quite grip me. I like the ending though the start was not brilliant and the middle was alright. At some points it lost me and at others it really piced up. benedictl gave Letters from the Lighthouse 4 out of 5 and now plans to read The Explorer by Katherine Rundell. molly gave Letters from the Lighthouse 5 out of 5 and now plans to read The Explorer by Katherine Rundell. This was a very pleasant book ;very emotive. However sometimes it becomes a bit boring . It has a great story line ; in between the big bits it could use more action , more excitement. I give this book a strong two - it was lovely to read but it was not my cup of tea . Ruby gave Letters from the Lighthouse 2 out of 5 and now plans to read The Boy with One Name by J R Wallis. This was the 1st Leeds Book Award book I read. Letters from the Lighthouse is full of mystery, emotion, and surprise. I enjoyed the middle the most because it kept me hooked in. If I didn't have to read it, I might have still chosen it after reading the blurb on the back. Caitlin gave Letters from the Lighthouse 4 out of 5 and now plans to read The Dragon with a Chocolate Heart by Stephanie Burgis. If you love danger and mystery this book is perfect for you. My favourite part is when olive and Esther become friends instead of foe. My favourite character is cliff olives brother.As i said whoever loves mystery this book is positively for you. Ellen gave Letters from the Lighthouse 5 out of 5 and now plans to read Just Call Me Spaghetti-Hoop Boy by Lara Williamson. I feel that this book has a very touching and heart-warming story to it;I also like how the author uses words,phrases and other related WW2 facts.Overall,I feel that this book is a fantastic story and I recommend this to teachers as a class novel when are learning about WW2. Ava gave Letters from the Lighthouse 5 out of 5 and now plans to read The Boy with One Name by J R Wallis. James gave Letters from the Lighthouse 4 out of 5 and now plans to read Who Let the Gods Out? by Maz Evans. It was full of suspense and tension and I also like the way it is set in 1941 in WW2 and how it felt for kid as to be evacuated in that time. Samir gave Letters from the Lighthouse 5 out of 5 and now plans to read The Explorer by Katherine Rundell. This is an amazing book and I really like it and my favourite character was Virgo and in three words this book is hilarious heartfelt and adventurous. I would recommend it to anyone who would like adventure. The age group I would recommend it to is 8 to 12. My favourite chapter is the first one because it just starts the mysteries of. This is totally the book for people who like mysteries. Shelly gave Letters from the Lighthouse 4 out of 5 and now plans to read The Boy with One Name by J R Wallis. The description and drama in the book was pretty good but it wasn't reall my style of book. Amber gave Letters from the Lighthouse 3 out of 5 and now plans to read Who Let the Gods Out? by Maz Evans. This book is AMAZING !!! I absolutely loved it. It was a very unexpected ending but I loved it it was filled with lots of different emotions. I really recommend this book. And if you like history you will really enjoy this book! I loved it so much. Shanice gave Letters from the Lighthouse 5 out of 5 and now plans to read The Boy with One Name by J R Wallis. I really love letters from the lighthouse. It is such a amazing book! It is so suspenseful and you don't know what is going to happen. There is lots of interesting twists and turns. My favourite character is Olive because she never gives up and she is very brave. I rate this book a 5 out of 5 because I couldn't put it down after the minute I started it. Molly gave Letters from the Lighthouse 5 out of 5 and now plans to read The Boy with One Name by J R Wallis. This book is fab it really catches the world war 2 vibe and how it was like to live there.Its tension graph is up down,down then up again it really is an emotion ride.It's like this book takes you on an actual adventure. Loweeza gave Letters from the Lighthouse 5 out of 5 and now plans to read The Boy with One Name by J R Wallis. I really enjoyed reading this book because I like reading books that are a bit like the World Wars 1 and 2. I found this book really intriguing and interesting, I'd love to read it again!!! Mackenzie gave Letters from the Lighthouse 5 out of 5 and now plans to read The Dragon with a Chocolate Heart by Stephanie Burgis. I found this book really entertaining because it gave the right amount of description and it taught me lots about the Second World War. However, because of everything that was happening in the book it was quite hard to follow. It was the best book I had read in a long time. Kate gave Letters from the Lighthouse 4 out of 5 and now plans to read The Explorer by Katherine Rundell. I thought this book was amazing and really explained what it was like to live in World War 2. The characters were amazing, amount of drama was astounding! It definitely deserves 5 stars and this book is the best book I've read so far! Sarah gave Letters from the Lighthouse 5 out of 5 and now plans to read The Dragon with a Chocolate Heart by Stephanie Burgis. Olive and Cliff were evacuated to Devon and whilst living in a lighthouse they discover many things such as what the mysterious note that their sister(Sukie) received meant. I mostly admired Olive because when they were evacuated,she met a Jewish girl, Esther and from enemies they became best friends. When I opened I felt as if I was there running on the beach with Esther and Olive rescuing the Jewish people in the middle of the night. I was determined to turn every page to find new adventures and that is why I gave this book a score of 5/5. I would recommend this book to lovers of mystery and adventure. Zuzia gave Letters from the Lighthouse 5 out of 5 and now plans to read Just Call Me Spaghetti-Hoop Boy by Lara Williamson. WHAT A FANTASTIC READ THIS WAS!!! It will go down in history as one of my best books ever! I felt like I was there with Olive, Cliff and Sukie in London during the 2nd world war. I noticed the anxiety well up inside me when Sukie went missing in the air raid and the children were evacuated to Devon. It was like slowly unscrewing the lid off a fizzy pop bottle as the plot was revealed bit by bit (bubble by bubble) which captured my interest throughout â€“ and that is no mean feat!! The move to Queenieâ€™s house (Sukieâ€™s supposed pen-pal) was not all that it seemed. A jumble of coded messages, spies, refugees and secrets ends in the family being re-united in a truly breath-taking story which I give 5 out of 5 and would recommend for ages 9 and over. Eliza Bea gave Letters from the Lighthouse 5 out of 5 and now plans to read Just Call Me Spaghetti-Hoop Boy by Lara Williamson. This book held my interest because it had plenty of drama. For example, evacuations and spies. I like the ending because there is a reunion and this made me smile. If you like books set in the past you will like this book. Orlaith gave Letters from the Lighthouse 4 out of 5 and now plans to read The Dragon with a Chocolate Heart by Stephanie Burgis. I would recommend this book because it was really interesting.Throughout the book the emotion changed and this kept me interested. The book was based on a real life situation and the characters were believable. I liked the ending because everything came together nicely. Darren gave Letters from the Lighthouse 5 out of 5 and now plans to read The Dragon with a Chocolate Heart by Stephanie Burgis. I loved this book and it is my favourite book so far. I liked it because it's about real life events that have been turned into a thrilling adventure.My favourite part is when all the secrets start to unfold near the end. My favourite character is Sukie because she is brave and very clever. She is also a mystery throughout the book because nobody knows where she is. Rosie gave Letters from the Lighthouse 5 out of 5 and now plans to read The Dragon with a Chocolate Heart by Stephanie Burgis. Lily-Rose gave Letters from the Lighthouse 4 out of 5 and now plans to read Just Call Me Spaghetti-Hoop Boy by Lara Williamson. it was a very gripping and detailed story. the characters are easy to relate to, fun and each one is different. the story is shocking with LOTS of plot twists. what i would say is that it takes a while to get into it, its quite slow paced, and i found it quite hard to read in places without wanting to put the book down. despite this, i found the ending amazing and would read more of the authors books. Seren gave Letters from the Lighthouse 4 out of 5 and now plans to read The Boy with One Name by J R Wallis. This is a heartwarming story in a world where anything can happen.My favourite character is Olive because she is brave and courageous.I really enjoyed this book. It had really intriguing parts where you just didn't want to stop reading. On the other hand, there were parts I didn't find interesting, parts that I wanted to skip.I would recommend this book to anyone who likes reading about the WAR.I would definately rate it 4/5. Jessica gave Letters from the Lighthouse 4 out of 5 and now plans to read Just Call Me Spaghetti-Hoop Boy by Lara Williamson. I found this book very enjoyable to read;I love reading war stories like this one! My favourite part was when everyone from the boat was safe and also when Sukie was found. Lily gave Letters from the Lighthouse 3 out of 5 and now plans to read The Dragon with a Chocolate Heart by Stephanie Burgis. This book was a fabulous read. I really felt moved after reading it. It showed that no matter what we look like or what religion we are we all deserve the same opportunity's and should all be treated the same. Emma Carroll is a truly wonderful author and has her readers hooked in from the first page! Maisy gave Letters from the Lighthouse 5 out of 5 and now plans to read Who Let the Gods Out? by Maz Evans. I really enjoyed this book. It had really intriguing parts where you just didn't want to stop reading. On the other hand, there were parts I didn't find interesting, parts that I wanted to skip but I carried on and it got better. My favourite part was the last 50 pages because there is a lot of surprising events that happen at the end. The main characters from the beginning are Olivia (Olive) and Cliff, her younger brother. As the story goes on, you meet some more characters that become main characters as well. for example: Esther, Ephraim and Queenie. I definitely recommend this book to anyone who enjoys war-based drama books or just anyone who likes action packed novels. Violette gave Letters from the Lighthouse 5 out of 5 and now plans to read The Dragon with a Chocolate Heart by Stephanie Burgis. This is a fabulous book and I think I would really recommend it to people who enjoy books which have war in it. I think what makes this book amazing s that is has all of he description for you to imagine. This is my 3rd favourite book and my favourite character is sukie because she is very sensible and mature in my opinion. Shelly gave Letters from the Lighthouse 3 out of 5 and now plans to read The Boy with One Name by J R Wallis. Ava gave Letters from the Lighthouse 5 out of 5 and now plans to read Just Call Me Spaghetti-Hoop Boy by Lara Williamson. A very heart-warming book that had me captivated on its every word. I would like to read more books by this author as this one was like nothing else I have ever read. Its unique twists and story line make this by far one of my favourite books. I would highly recommend this book for ages 10+ due to its complex vocabulary and topics (World War 2). Amelia gave Letters from the Lighthouse 5 out of 5 and now plans to read Just Call Me Spaghetti-Hoop Boy by Lara Williamson. I highly recommend this book for ages 10+ as the vocabulary is sometimes difficult to understand and you need to know a little bit about World War 2. Aoife gave Letters from the Lighthouse 4 out of 5 and now plans to read The Explorer by Katherine Rundell. This book was so great I could not put it down! It took me through a roller-coaster of emotions, from excitement to tears. I highly recommend this book for anyone looking for a tear-jerker. I really felt like I was a part of the story. Fatima gave Letters from the Lighthouse 5 out of 5 and now plans to read The Dragon with a Chocolate Heart by Stephanie Burgis. Drew gave Letters from the Lighthouse 5 out of 5 and now plans to read The Dragon with a Chocolate Heart by Stephanie Burgis. This book drew me in as soon as I turned the first page ,also itâ€™s filled with drama and emotion . Jamie gave Letters from the Lighthouse 4 out of 5 and now plans to read The Boy with One Name by J R Wallis. This book is such a great,gripping and a must read.I think Olive is so kind and caring towards her brother and others around her, she couldn't care less about herself.The mystery behind the book and the code that Olive has to crack is so interesting can you crack the code that Olive must do? Gabriella gave Letters from the Lighthouse 5 out of 5 and now plans to read The Boy with One Name by J R Wallis. This book was sad at the beginning but I really enjoyed the book because Olive is adventurous and I like exploring. Even though Olive hated the Germans, she helped a German pilot. Lukas gave Letters from the Lighthouse 5 out of 5 and now plans to read Who Let the Gods Out? by Maz Evans. bailey gave Letters from the Lighthouse 1 out of 5 and now plans to read The Boy with One Name by J R Wallis. Rhys gave Letters from the Lighthouse 5 out of 5 and now plans to read The Explorer by Katherine Rundell. This is a gritty book which you can really get in to. It has lots of mystery with a heart warming ending. Most of the characters are believable but Gloria is hard to get to know. I would recommend it because it teaches you. Chineadu gave Letters from the Lighthouse 4 out of 5 and now plans to read The Dragon with a Chocolate Heart by Stephanie Burgis. Thomas gave Letters from the Lighthouse 4 out of 5 and now plans to read The Explorer by Katherine Rundell. This book is cool and really serious my favourite part is Hitler will send no warning because it is a good head line and the best part on that page is were its going to the edge of the cliff with the suitcase. It just is an amazing chapter and I love it. My thing to improve on is make more exciting because its quite dull and dark but I like the part wear it talks about the treehouse and my favourite character is Queenie she is a good character because she likes to not show her sadness. Connor gave Letters from the Lighthouse 4 out of 5 and now plans to read The Dragon with a Chocolate Heart by Stephanie Burgis. This book is about a girl who has loss her sister they get evacuated to a strange lighthouse keeper. In this book there are a lot of cliffhangers that makes me want to find out what happens next. Grace gave Letters from the Lighthouse 4 out of 5 and now plans to read Who Let the Gods Out? by Maz Evans. A sensational book,really grips you.I didn't expect to enjoy it but I loved every bit of.I also admired Olives brave personality and she helped those in need. Tormaigh gave Letters from the Lighthouse 4 out of 5 and now plans to read The Boy with One Name by J R Wallis. This book is a very sad at the beginning but slightly happier. i like the fact that Olive always helps people even though she doesn't like them. Despite the fact Olive hated the Germans, she helped an German pilot. Also the great Olive is very adventurous and always has a positive attitude. I'd recommend this book year 5 and over. pratyush gave Letters from the Lighthouse 5 out of 5 and now plans to read Just Call Me Spaghetti-Hoop Boy by Lara Williamson. I think this book was very well written as it added the panic of the war. I also thought that the plot twist was very unexpected and the blurb didn't give much away. It knew how to grab the emotions and make you read more. Fran gave Letters from the Lighthouse 5 out of 5 and now plans to read The Explorer by Katherine Rundell. I would rate this book 100 out of 5, but because I can't do that, I say 5. You really get to know Olive, and feel like you are embarking on the heart-warming journey with her; travelling to a mysterious village, going to live in a tumbledown lighthouse with a secretive owner and meeting a bullying girl with a suprising background. This book is a brilliant read that includes every emotion and, although it is set in WW2, still effects our lives today, in how we treat the people around us. isabella gave Letters from the Lighthouse 5 out of 5 and now plans to read The Boy with One Name by J R Wallis. Lilyanna gave Letters from the Lighthouse 4 out of 5 and now plans to read Who Let the Gods Out? by Maz Evans. Letters from the lighthouse is a story set in world war 2. It was a bit slow at start but I soon picked it up. It is one of my favourite books I have read in a while. It was like I was a character in the story. It is about children who have to evacuate and live in a lighthouse. It made me think it must of been scary to leave their home and live somewhere else but a fantastic adventure. I would truly recommend this to children who like history and mysteries. Olivia gave Letters from the Lighthouse 5 out of 5 and now plans to read The Dragon with a Chocolate Heart by Stephanie Burgis. One of my favourite books ever! I got into it from the very beginning and I loved it. It was full of adventure, mystery and even some history. Esther was a great character who I earned a lot and changed to become kind by the end. I would recommend this book to anyone I know! Lucy gave Letters from the Lighthouse 5 out of 5 and now plans to read Just Call Me Spaghetti-Hoop Boy by Lara Williamson. This is an interesting novel by Emma Carrol; if you like books set in history, this is a great book for you because it is set in world war II. Olive and Cliff are sent away to live with a woman, age 15, called Queenie. Their sister Sukie has gone missing; she was last seen down a side street with a man giving her a secret code! After Sukie had gone missing, Olive found the secret code in the pocket of the coat Sukie had been wearing; now it is up to her and Cliff the crack the code before time runs out ! I gave this book 5 out of 5 because it is absorbing and thought-provoking! I recommend this book for children age 9 and up! Fiona gave Letters from the Lighthouse 5 out of 5 and now plans to read Who Let the Gods Out? by Maz Evans. I lOVED this book! The plot to the characters was amazing. I loved how the author described the characters feelings. And brought the reader into a world of imagination and creativity. This really made me imagine what it looked like and how WW2 was . Overall I would definitely recommend this book to others! Laila gave Letters from the Lighthouse 4 out of 5 and now plans to read Just Call Me Spaghetti-Hoop Boy by Lara Williamson. Ethan gave Letters from the Lighthouse 5 out of 5 and now plans to read The Dragon with a Chocolate Heart by Stephanie Burgis. This is one of my favourite books.Since I am 10 reading through this I didn't know a lot of the meanings of words now I do. I would definitely recommend this book, it's sad but at the same time happy,the ending is a happy ending though. At first I didn't like Esther but as I kept reading she became moe loving and kind. Definetely read this book! ðŸ˜ I loved that the family got reunited at the end, and that they finally saw Sukie again. Ellie gave Letters from the Lighthouse 5 out of 5 and now plans to read The Explorer by Katherine Rundell. I enjoyed the book and I think Emma Carroll is a talented writer. I would definitely recommend this book to anyone who loves war-themed book. My favourite character is Sukie. I would definitely read it again. Hamna gave Letters from the Lighthouse 3 out of 5 and now plans to read Who Let the Gods Out? by Maz Evans. While I was reading this book it was sad but also a great story. At the end it was my favourite bit because they were reunited with Sukie, they were there as a family in Budsmouth. At first I wasn't keen on Esther but as the book went along she got more kind and loving. As a 10 year old during this book you find out a lot more words you've never heard off, which is amazing. It is one of my favourite books! I really loved reading this book I loved every part of it. Near the end of this book it was very sad but I still really enjoyed reading it. Katy gave Letters from the Lighthouse 4 out of 5 and now plans to read The Boy with One Name by J R Wallis. This book is amazing! It centres around Olive and cliff, evacuees during WW2, who find a coded message from their missing sister Sukie. The book is an excellent mystery mingled with an interesting time period, however the ending is too predictable and too 'happily ever after'. Lauren gave Letters from the Lighthouse 4 out of 5 and now plans to read The Dragon with a Chocolate Heart by Stephanie Burgis. I've really enjoyed this book but the beginning is a little anti-climatic. The first main event was really confusing but as the story went on, I was starting to understand it. There are a lot of cliff hangers and tense moments which add to the great storyline. All the time which I spent with my nose in this book really paid off when I finished it. I would recommend this book to anyone who likes adventure, history and emotional stories. This is a fantastic book, I would love to read more books by Emma Carroll. ali gave Letters from the Lighthouse 4 out of 5 and now plans to read The Dragon with a Chocolate Heart by Stephanie Burgis. The book is about a boy who delivers letters during WW2.He delivers them for people who are sending them to people who can't get them to the place they need to be. He is evacuated to a lighthouse where he lives with his brothers and sisters. Then he gave Jews a little hand and at the end then he had a party. I liked about the book that it is adventurous and I also liked it when they helped the Jews out. I also liked the book because as soon as I read the first page I couldn't stop reading the others. My favourite character is Olive because she came up with the idea of helping the Jews. However, I didn't like the bit when a German pilot crashed and people were shouting don't help him. As a result, I loved the book and I would relate it to The Boy in the Striped Pyjamas. I would highly recommend this book to a younger person 9-12 because it is set in WW2. ruby gave Letters from the Lighthouse 5 out of 5 and now plans to read The Dragon with a Chocolate Heart by Stephanie Burgis. A great book! WW2 themed and amazing! In my class, we're learning about it and this book helps! The detail,plot and the few twists are great as this makes the story good. I would definitely recommend it to everyone. Sophia gave Letters from the Lighthouse 4 out of 5 and now plans to read The Dragon with a Chocolate Heart by Stephanie Burgis. It had a slow start but when it got going, I really enjoyed this book. I found it interesting because it made me understand what it would have been like to leave home in world war 2. But it also made me feel sad for the way the Jews were treated.However In the end it had a very happy ending. Lucy gave Letters from the Lighthouse 4 out of 5 and now plans to read The Boy with One Name by J R Wallis. Really good book.Anyone who likes WW2 will LOVE this.I recommended this to my friend who loves WW2. The only think I do not like it that the ending is boring although it is quite a good book! Fiona gave Letters from the Lighthouse 4 out of 5 and now plans to read Just Call Me Spaghetti-Hoop Boy by Lara Williamson. This is an enjoyable novel, which was a fiction. I think this is the best out of all books on the list. I would personally like to meet the author in person on the Leeds Book Awards day when the authors are congratulated and given an award. It was about a girl named "Olive" who was in the middle of a WW2 battle. She was bombed at the theater and didn't know where her sister went. Could she find her sister? David gave Letters from the Lighthouse 5 out of 5 and now plans to read The Dragon with a Chocolate Heart by Stephanie Burgis. Caseybree gave Letters from the Lighthouse 4 out of 5 and now plans to read The Boy with One Name by J R Wallis. This has immediately become my favorite book! So mysterious , so adventurous I love it! This book deserves five stars and i would recommend this book to lots of people to read as well! This book is about a time long ago when something bad happened... Its quite an old book with old names like Sukie, Cliff and Olive! So if any kids out there want to be a detective and kind of want an idea about what it is like then this is the book for them! Rebecca gave Letters from the Lighthouse 5 out of 5 and now plans to read The Dragon with a Chocolate Heart by Stephanie Burgis. Peter gave Letters from the Lighthouse 3 out of 5 and now plans to read The Explorer by Katherine Rundell. I was stunned by the plot line, also the book was heart warming and adventurous. This book was really acceptable; I advise the author to keep on writing books like this one. I felt the affection between me and the smooth pages, I really recommend this book to admires of war and fantasy. Theo gave Letters from the Lighthouse 5 out of 5 and now plans to read The Dragon with a Chocolate Heart by Stephanie Burgis. I really enjoyed reading this book . It is full of adventure and I would recommend this book to everyone I know .My favourite character is Cliff because he is brave and reliable . I give Letters from the lighthouse 5 out of 5. Francesca gave Letters from the Lighthouse 5 out of 5 and now plans to read Just Call Me Spaghetti-Hoop Boy by Lara Williamson. I love the affection between Olive and her older sister Sukie. The dog Pixie is an adventurous pup and I never knew a DOG CAN CLIME A LADDER!!! Jinan gave Letters from the Lighthouse 5 out of 5 and now plans to read The Dragon with a Chocolate Heart by Stephanie Burgis. An amazing book that I would recommend for all ages. A definite read for anyone into codes or WW2. It is all about secrets, refugees and evacuees and a brilliant book for any point in the day / any day of the week. The Bradshaw are sent away from home to a mysterious lighthouse keeper who knows more than he lets on at first. Once again it is such a good book and everyone should give reading it a go. Definitely one of my favourite books ever. Sam gave Letters from the Lighthouse 5 out of 5 and now plans to read The Explorer by Katherine Rundell. The first page sucked me into the dangerous life of the Bradshaws. It was very emotional and amazing.I would recommend this book to people who like the war genre or emotional books.This is one my favourite books.Emma Carrol has written a wonderful book. Aum gave Letters from the Lighthouse 5 out of 5 and now plans to read The Explorer by Katherine Rundell. I absolutely loved and it was a mix between a sad and happy book. The author put in tension at the right time and my favourite character was Sukie. Naushin gave Letters from the Lighthouse 5 out of 5 and now plans to read The Boy with One Name by J R Wallis. This book is incredible so far as soon as I saw this book I was like I need this sooooooo much. I love letters from the lighthouse I recommend it. Even though I am a slow reader it is still so good. Recommended for 9-11 year olds. Emma Carroll is an amazing author. Ellie gave Letters from the Lighthouse 5 out of 5 and now plans to read The Dragon with a Chocolate Heart by Stephanie Burgis. This book was amazing; I loved it. I started it and couldnâ€™t stop. Olive and her family go to the movies and there sister Sukie goes missing during an air rade. Olive and Cliff are evacuated to Budmouth point. Olive finds a note in Sukieâ€™s coat and she is determined to find out what it says. Will Olive find Sukie? Will she find out what the note says? I would recommend this book for ages 9 and over. Livia gave Letters from the Lighthouse 5 out of 5 and now plans to read Just Call Me Spaghetti-Hoop Boy by Lara Williamson. Katy gave Letters from the Lighthouse 5 out of 5 and now plans to read The Explorer by Katherine Rundell. This is one of my absolute favourite books that I've read in a long time! It's set in World War 2 Britain and tells the story of Olive and Cliff, who evacuate to a Lighthouse and have to face all the adventures it brings. Despite being away from home themselves they offer help and support for others in a very similar situation. It's bursting with compassion, kindness and courage, from the second you pick it up, you won't want to put it down. Megan gave Letters from the Lighthouse 5 out of 5 and now plans to read The Dragon with a Chocolate Heart by Stephanie Burgis. This book is about 3 siblings, Sukie, Cliff and Olive surviving world war ii, but right from the very start disaster strikes : An air raid. Sukie goes missing, Cliff and Olive have to evacuate to Devon where everyone seems to be mysterious in their own way. Olive finds a strange coded note which seems to link to Sukie. I couldn't put this book down!! Isabel gave Letters from the Lighthouse 5 out of 5 and now plans to read Just Call Me Spaghetti-Hoop Boy by Lara Williamson. Megan gave Letters from the Lighthouse 4 out of 5 and now plans to read The Explorer by Katherine Rundell. I realy enjoyed this book because it seemed a bit like a diary so you could actually see what it was like to be Olive.Its brilliant because some things change and some things dont.It has secrets that you cant even guess before you finish the last page. Seren gave Letters from the Lighthouse 4 out of 5 and now plans to read Who Let the Gods Out? by Maz Evans. 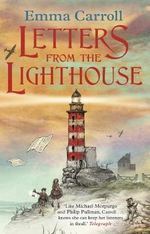 Letters from the lighthouse was a brilliant book.I would recommend this book to 9-14 year old`s . Olive was very brave and thoughtful .It must be very hard to be an evacuee. Rudee gave Letters from the Lighthouse 4 out of 5 and now plans to read Who Let the Gods Out? by Maz Evans. I love Letters from the lighthouse so much! It Is my favourite book from the whole shortlist! It is so exciting, gripping and it has lots of twists and turns. I couldn't put it down! My favourite character is Olive because she is so brave and courageous also, she would do anything to save her little brother. I rate this book a five out of five. Letters from the Lighthouse is a heart warming story set during world war 2 . It is a tale of an evacuee and is about how she copes.I found this book so easy to get into and it was like I was there with the character, I would recommend this book to anyone who likes tales of adventure and mystery. Caitlin gave Letters from the Lighthouse 5 out of 5 and now plans to read The Dragon with a Chocolate Heart by Stephanie Burgis. Matthew gave Letters from the Lighthouse 5 out of 5 and now plans to read The Boy with One Name by J R Wallis. I liked this book becauseit is about evacuees and a lighthouse keeper named ephraim. The evacuees are called olive and her brother cliff and her older sister sukie goes missing which makes it mysterious.My favouritist character is olive because shes nosey and wants to know everything.You will like this book if you like adventures.You wont like this book if you like calm books. logan gave Letters from the Lighthouse 3 out of 5 and now plans to read Who Let the Gods Out? by Maz Evans. This book is amazing. It is heart-warming yet breath-taking. Olive, Cliff, Sukie and their mum went to the movies that night but a bomb blasted and her sister Sukie went missing. Sukies pen pal is Queenie. Or is it? They got evacuated to Devon where they live in a light house. She finds a secret note in the pocket of her sisterâ€™s coat. It was a secret code. Olive works out the code but is it too late? If you like mystery books than this is the book for you. Recommended for ages 10 years and over. Skye gave Letters from the Lighthouse 5 out of 5 and now plans to read Just Call Me Spaghetti-Hoop Boy by Lara Williamson. This book is a World War 2 story. It is about a girl who is evacuated from London to Devon. I like this book as it is a real page turner and it made me feel intrigued to keep reading. My favourite character in this story is Olive because she is very nosey, trying to listen to everyone's conversations, just like me. As I read, it was like I was her best friend, doing everything together. I didn't like parts of story as it was sad, as she had to leave her family. I think this will fit with readers who are enjoy mystery books. callum gave Letters from the Lighthouse 4 out of 5 and now plans to read Who Let the Gods Out? by Maz Evans. I think this book has been really well made. The build up is really strong and the end is very sweet. The writer has done very well. Sometimes the build up is too much and then drops. I highly recommend this book. Eryn gave Letters from the Lighthouse 4 out of 5 and now plans to read The Boy with One Name by J R Wallis. kaitlin gave Letters from the Lighthouse 5 out of 5 and now plans to read Just Call Me Spaghetti-Hoop Boy by Lara Williamson. I really enjoyed this book. I would definitely recommend this to anybody who likes war theme books. My favourite character is Olive and I found it really funny when she got a egg sized bump on her head. I like the name of the title because it sounds mysterious. Farhanah gave Letters from the Lighthouse 5 out of 5 and now plans to read The Boy with One Name by J R Wallis. I recommend this book because it is filled with cliff hangers to keep you reading.This book is about 2 Children[Olive and Cliff]that become evacuees and end up in a village in Devon.My favorite character is Olive because she is very determined.This story has sudden twists which I think are the things that keep you guessing what will happen.I recommend this book to people who like mystery's and sudden twists.I don't recommend this book to people who don't like sad and depressing scenes. Jakub gave Letters from the Lighthouse 5 out of 5 and now plans to read Who Let the Gods Out? by Maz Evans. This book is about 2 girls and a young boy.1 of the girls get lost in an air raid.The other girl and the boy get evacuated to live with a young teenage girl.My favorite character personally was Olive because she was really brave.The whole story felt extremely real like it was in front of me.For every part of the story it kept me guessing.My favorite part of the book was when the family reunited because they were finally together.The story gripped me and kept me turning the pages when it was very tense.I really wanted to know what would happen next as soon as i stopped.I loved everything about this book.I would recommend this book to people who like mysteries. This book is about two evacuees during the war and they get sent to a mysterious lighthouse keeper in Devon.I like this book because you dont know what is going to happen and its a page turner.Olive was my favourite character because she is eager and doesnt let anything stand in her way.My favorite part of the book is that its mysterious. In would recommend this book for people who like mysterious books and adventure books. Leigha gave Letters from the Lighthouse 5 out of 5 and now plans to read Just Call Me Spaghetti-Hoop Boy by Lara Williamson. I enjoyed the twists and the plot line but I wish it had more detail within the story. Olive, the main character was interesting because she was determined but she could also be stubborn too! I hope the author keeps writing more stories -I would recommend it to my friends who like adventure/mysteries. Megan gave Letters from the Lighthouse 3 out of 5 and now plans to read Who Let the Gods Out? by Maz Evans. This book was absolutely AMAZING! It has all you would want in an adventure story. An adventureous big sister, an annoying little brother, a mysterious lighthouse keeper, a bad lifeguard and lots more. I really enjoyed this book because i am really into historical fiction. I would recomend this book to peple who are into WW2 and historical fiction. Jakub gave Letters from the Lighthouse 5 out of 5 and now plans to read The Boy with One Name by J R Wallis. this book was really good well more than good i loved how it was a war related because i love war this book was fantastic and i liked the idea of them painting the light house so it is camouflage from the planes,also how they were nice to Jerry as they call the Germans when the plane came down. my Favorited character was Sukie because she stood up and helped people. Mazey gave Letters from the Lighthouse 5 out of 5 and now plans to read Who Let the Gods Out? by Maz Evans. 1941. World War 2 has been under way for 2 years. Olive's sister Sukie goes missing in an air raid. She makes it her mission to find her. Before she can start searching, Olive and her younger brother Cliff are evacuated to Devon. Here they meet Queenie, Sukie's pen-pal. Perhaps she is the key to finding Sukie. Queenie, however, is not everything Olive imagined her to be. Letters from the lighthouse. Strange radio conversations. Clocks set at ten minutes past two. How do all these link? Does Sukie fit into this puzzle? Can Olive and Cliff save their sister? If you like a great mystery story written with true passion and so realistic that you feel like you're there, then this really is the book for you! Despite the dull start and somewhat confusing story line, this novel gets going, revealing it's secrets along the way. It's sure to keep you turning the pages. Johnny gave Letters from the Lighthouse 4 out of 5 and now plans to read Who Let the Gods Out? by Maz Evans. This was a breath-taking novel about the darkest years of world history.It was a riveting read and I would certainly read it again.I could pick this book up and it would take me on an adventure as if I was in this roller coaster of emotions story.It was about three siblings who lived in the city of London during the war, and were evacuated to live in a little village called "Budmouth Point". Before these siblings were evacuated, during an air raid in London their eldest sister went missing. Something at this new village is very suspicious, and the two other siblings are desperate to find out more. I would definitely give this book a well-deserved 5 out of 5 and I hope other people would rate this too. Letters from the lighthouse is a novel by Emma Carol. It takes you on an amazing adventure about a girl named Olive and her younger brother Cliff. When their older sister Sukie goes missing in an air raid suddenly everything goes wrong. They are evacuated and live with many different people, all who have secrets of their own. A coded note is the only clue. Can they and will they crack the code? All the way through there is constant excitement and the book is a definite page turner. I give it 5 out of 5 stars all the way through. I recommend it to people who love hearing stories with excitement and mystery, so why not give it a go? Charlotte gave Letters from the Lighthouse 5 out of 5 and now plans to read The Dragon with a Chocolate Heart by Stephanie Burgis.